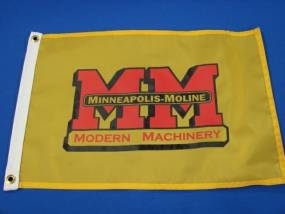 Minneapolis Moline Logo, Screen Printed On A Good Quality, Nylon, 12" X 18" Flag With Canvas Header And Brass Grommets. Great For Displaying On Your Tractor, Golf Cart, Motorhome, Yacht, Whatever! Proudly Made In The USA.